Russian president, Vladimir V. Putin, was briefed by his defense minister, Sergey K. Shoigu, regarding Russia’s military action against ISIS in Syria. During the discussion, Putin was informed that airstrikes have been conducted over possible ISIS militant sites and 26 cruise missiles were fired on Syrian targets. Although Russia claims to be targeting violent militant groups, innocent civilians’ lives are being taken as a result of multiple airstrikes that Russia still continues to conduct. What role does the US play in this? None. Absolutely none. If anything, the US is acting as an understudy and hoping for the main actor to get sick so that he can step up and portray the character accurately, as he feels that the existing actor is lacking. The US was given ridiculously short notice from Russia before the airstrikes began. How short you ask? A one-hour warning! That’s like walking up to your enemy and informing them that you’re going to slap them in the face right before you actually do it. I know, it hurts! This news comes a few weeks following the 2015 UN General Assembly where the President of the United States addressed the United Nations body. In the address, Mr. Obama spoke about conflict between Russia and Ukraine. He stated, “...we want a strong Russia that’s invested in working with us to strengthen the international system as a whole.” Mr. Obama expressed his willingness to work alongside Russia, United States’s strongest adversary, for the betterment of the international system which benefits the entire world. But, here we have Russia, pretending to work with the US by giving one-hour warnings prior to a missile strike that threatens the lives of many innocent civilians. Is Russia on the verge of starting tension with the US? The Pope did what at the Vatican? “I would like to ask for forgiveness in the name of the church for the scandals that have happened in this last period both in Rome and at the Vatican; I ask for your forgiveness.” This was the introductory statement that the Pope made before he began his weekly address in St. Peter Square. The apology was uncommon and a surprise to many. There have been multiple church scandals that have occurred over the last few years. Although some priests involved in such scandals were prosecuted, no statements were publicly made by the Pope regarding this concern. Such atrocious behavior has been recognized by the Pope in the Vatican city and the issue, as a whole, was addressed with an apology that he expressed. He didn't, however, refer to particular scandals. The incident is, in my opinion, very unorthodox and historic. It wasn't in any way planned. The apology was simply organic. Liberal Party makes a return to Canada after 9 long years! Former Vice President of the United States shared expressed his views on twitter while congratulating the newly elected Prime Minister. 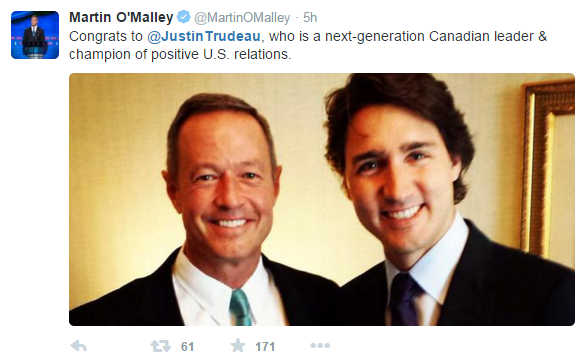 Republican Presidential Candidate, Martin O'Malley posted this picture of Justin Trudeau and him together. Indian Prime Minister took a moment to congratulate Justin Trudeau on social media.